Words cannot fully justify just how depressing the building which houses The Karczma is. It’s the kind of sixties architecture that I thought we were trying to eradicate in the city. It’s a sad slab of square grey concrete in a forgotten part of town. It’s Eastenders on Christmas Day. Inside could not be more different – its an ode to the inns of the Tatra mountains, seen through the tainted eyes of someone who misses them. There is straw thatched ceilings and fake fur hides adorning the backs of benches. Walls are distressed pink. Polish music plays in the background. I found it difficult to not laugh, despite being fully aware that whoever designed the space did so with serious intention. But the food. Oh My, the food. It’s a wholesome exploration of Eastern Europe family food, at all times satisfying and occasionally astonishing. We start with a communal helping of bread and lard, a concept you may be familiar with, being the 2016 Michelin di rigueur of bread courses. Here it is not being dictated by fashion, but by a culinary history and frugalness that makes use of all of the animal. More importantly it tastes great, helped by pickles full of zing and bite. 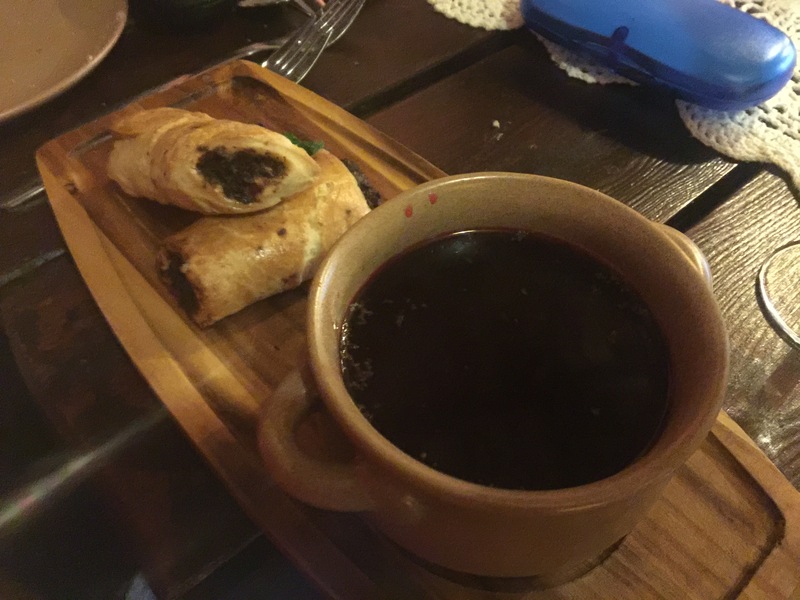 There is a blood red beetroot soup, barszcz, or, as you may know it, borscht. Whatever the name, its a tribute to fermentation, soured and bright in flavour and colour. Two pastry rolls filled with a duxelle of mushrooms feel like they are there to justify the £6 price, though they succeed in adding a further depth to bowl already swimming in it. 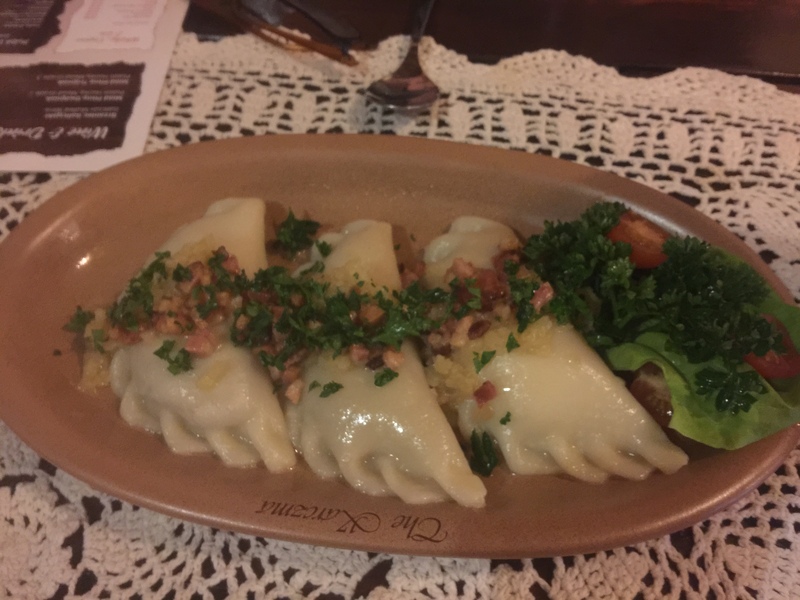 Pierogi are delicate filled dumplings, almost translucent. Each one is a powerhouse of flavour, from the cheese, potato and onion, to the minced pork and beef which has a lightness that alludes its appearance. One of these is a hefty starter in its own right; here three of them are under £8. 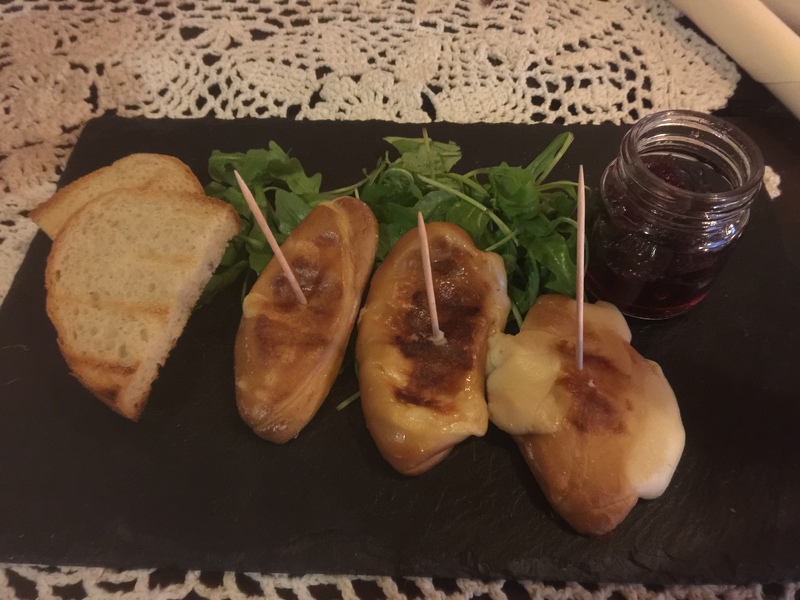 Another starter of smoked cheese would be the only duff note. There is too much of the smoke which wipes out the sharp cranberry compote. 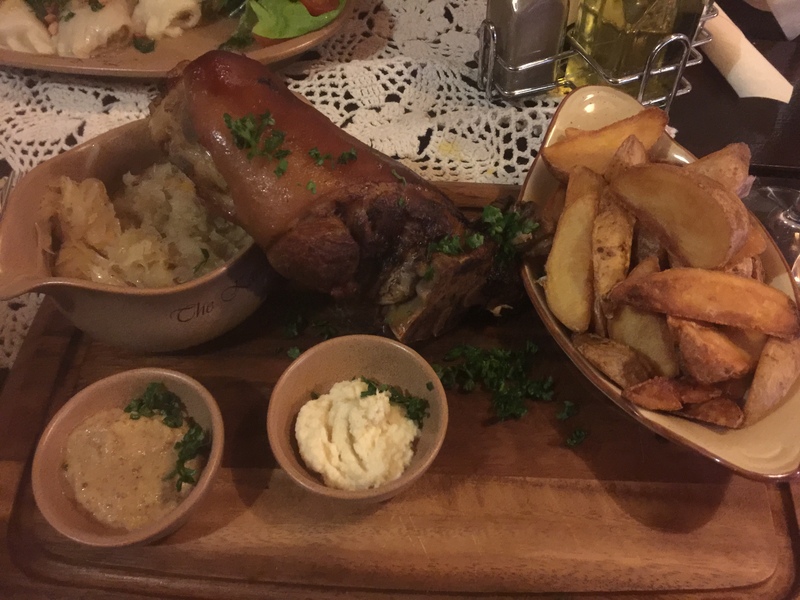 A whole glazed pork knuckle was as comforting as it was daunting. The burnished skin peeling back to reveal a thick layer of fat and meat which pulls from the bone at the slightest suggestion. Pots of horseradish and mustard are there to provide heat, sauerkraut for acidity, and thick chips for the plain greedy. I take home half for dinner later that evening. 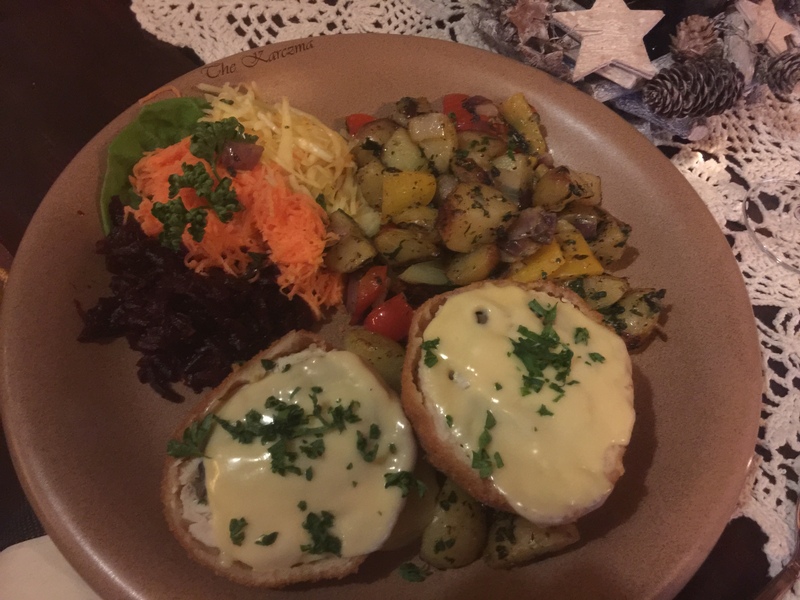 Also taken home in the same doggy bag was half of “marina’s breasts”; two domed hulks of formed chicken breast meat, stuffed with mushrooms and glazed with cheese. Its Chicken Kiev with a salacious new identity. I joke to the waiter about wanting more of Marina’s breasts – he tells me that she is working in the kitchen. I joke no more. 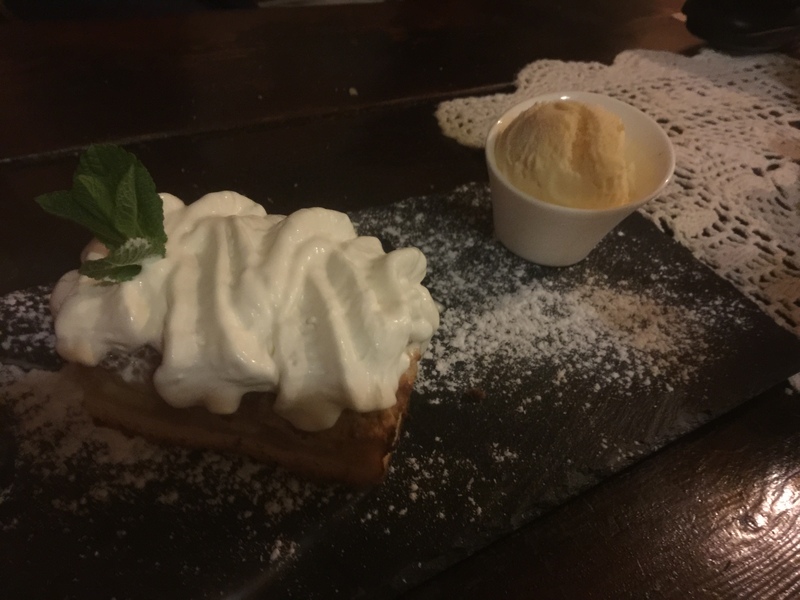 We finish with an apple pie, admirable in flavour but several courses too many, because, by now we are ready for a lie-down to let it all sink in. 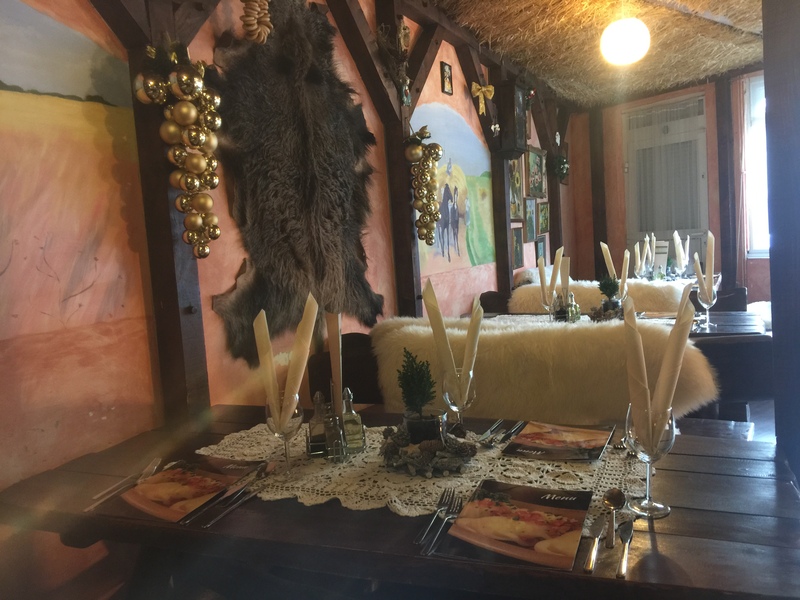 A friend of mine with Polish descent who joined me at The Karczma told me a story of a trip he made to his fathers home village in the 80’s: There the men were fed first, followed by the women, with the children picking up the last of the food. If The Karczma truly is representative of Polish home cooking those children did not go hungry. Its as generous a meal as I can remember and cheap to boot, too. What goes on inside those pink walls and under that thatched ceiling is nothing short of wonderful.